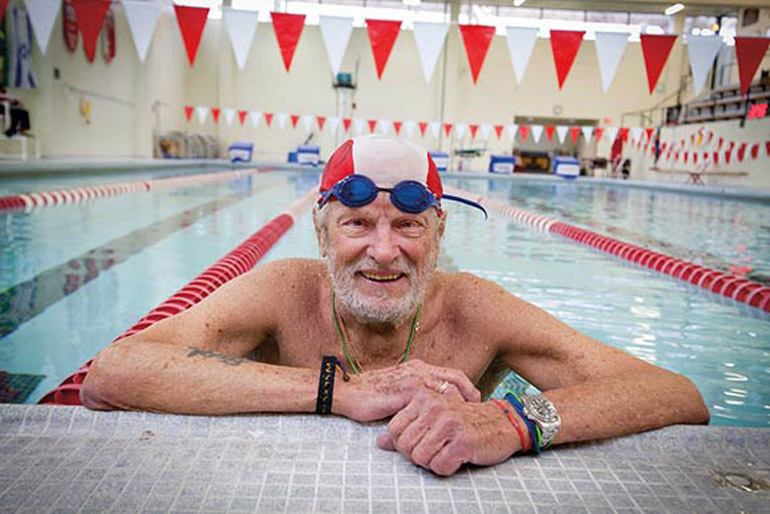 The man with the short grizzled beard and blue goggles is one of several swimmers doing mid-morning laps in the IIT Keating Sports Center pool. His arms move methodically in the rhythm of the freestyle—stroke, stroke, stroke-breathe. Stroke, stroke, stroke-breathe. These days, his pace is a leisurely one mile per hour. But in 1967, retired chemistry and physics teacher Ted Erikson (CHE ’52, M.S. CHEM ’59) was nearly twice as fast, a human projectile in a harrowing long-distance swim whose record still stands. That year, Erikson swam 26.4 nautical miles in 14:38 between California’s Farallon Islands and the Golden Gate Bridge. The water was notable for its cold temperatures, strong currents, and deadly creatures, specifically, great white sharks, orcas, and jellyfish. It was his third attempt to conquer the Farallons channel, as his second attempt the previous year resulted in a small snag—his temporary “death” due to hypothermia. Erikson’s resilience is a combination of self-described eccentricity, stubborn determination, and his rejection of the mainstream. Whether exploring panpsychism—the view that all matter, including water, has awareness—or fighting to preserve the shoreline of his beloved Hyde Park neighborhood sun and swim sanctuary, Promontory Point, Erikson is a true force, both in and out of the water. Born in Chicago at “a hospital near 39th and the Lake [Michigan],” Erikson has lived near a body of water his entire life except from ages 6–14, when his family moved to his stepfather’s ranch in land-locked Montana. But even there he thought about water, or more specifically, the lack of it, when drought hampered his family’s farming and cattle operations. His father suggested he return to Chicago to attend what is now South Shore International College Prep High School. After graduation, Erikson entered the United States Navy. Water drew him to submarine service, then to Key West, Fla., where he joined his first swim team. After the military, Erikson enrolled at IIT. During registration, he met the swim coach, who invited him to participate in a meet that evening. Erikson took first place in both events he entered, the 220- and 440-meter swims, and later was named swim captain while an undergraduate. 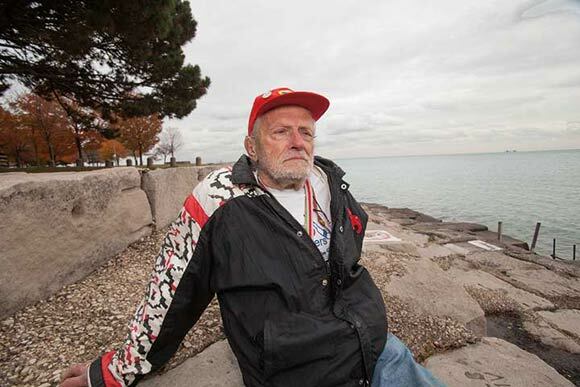 Ted Erikson looks out over the Lake Michigan waters of Chicago’s Promontory Point. While in graduate school, he became employed as a senior chemist at IIT Research Institute and dove into marathon swimming in earnest, competing in the 1961 Chicago-to-Michigan City, Ind., swim (“I took first because I was the only one to finish; everyone else dropped out.”) of 36.75 miles in 36:37; a 50-mile swim of 35:37 from Chicago to Kenosha, Wis., in 1962; and a 60-mile swim of 37:25 from Chicago to St. Joseph, Mich., in 1963. Taking second in the latter two events motivated him to beat the record for the double-English Channel swim between Dover, England and Calais, France, which he did in 1965, on his third attempt. His son, Jon, followed in his wake with seven channel crossings over 1969–1981, breaking his father’s double record held for a decade and setting the first record for the triple-channel. Another member of the record-holding family was the late Umbra, a black Labrador-greyhound stray that earned “Wonder Dog” status for her swimming accomplishments in a series documentary filmed by National Geographic Explorer. The dog made her aquatic debut at the Point, a naturalistic peninsula designed by Alfred Caldwell that is part of Chicago’s Burnham Park. Erikson has been frequenting the Point for more than a half-century and was arrested twice in the 1980s for swimming in deep areas away from beach access. After staging a “swim-in” and circulating a pro-swimming petition, Erikson and his fellow swimmers were able to keep the entire Point swim-accessible. In 2001, Erikson was among a group of concerned South Siders who met with city officials and members of the United States Army Corps of Engineers about their intention to replace the Point’s shoreline of picturesque limestone blocks with a sheer concrete-and-steel seawall. The controversial erosion-control project is still under debate. What is not being contested is Erikson’s Farallons Island record, though other swimmers are eagerly throwing their neoprene caps into the ring. In 2011, two six-person relay teams coordinated through the FISF failed to beat Erikson’s time.